"Wow!! What a blessing SpiritHorse has been for our family! Our daughter is having few, if any, meltdowns. Also, her ability to recall information has greatly improved. Thank you Gayle and volunteers for all you do!" I cannot thank Ms. Gayle for all her hard work with Austin today as always. Every time we leave the doctor it seems like we add another issue for Austin to tackle but she ALWAYS immediately begins working PT with him on the issue and I am always amazed with how creative she is to keep him having fun and working. Today she worked his feet and arches and began helping him stretch his feet in fun ways to help build the muscles (notice the rings on his feet) We love you and cannot thank you enough for all your hard work. Austin has come so far!!! " Caleb was diagnosed with ADHD in the spring of 2014. After having a bad reaction to medications for ADHD, we began searching for alternative ways to help him control his ADHD. Through our research, we came across Spirit Horse and decided to try equine therapy with him. Caleb completed the spring session at Spirit Horse before beginning kindergarten in the fall of 2014. The results we saw from his session with Spirit Horse were tremendous. Each day we went, Caleb had to help prepare the horse to be ridden, he learned how to ride the horse, he learned to help lead the horse while walking, and he learned how to care for the horse. He did this while under the constant guidance of Gayle Thorn and her volunteers. They were so patient with him. Each task that he learned how to do was intentional in helping him to learn how to handle the symptoms associated with ADHD. Caleb learned to take instruction, to follow through with tasks, to deal with frustrations in a task, and to remain in control of his body. Caleb’s time at Spirit Horse prepared him to begin Kindergarten. We are very thankful to Spirit Horse and her team of volunteers for working with our son. Sierra has been a student of the Spirit Horse Therapeutic Riding Center since February of 2014. She shows excitement and enthusiasm when it comes near to the time for her to have a lesson. She has learned the fundamentals of coordination such as balance, self-control, and posture. She has learned the responsibilities of taking care of others. The repetitive teaching techniques has increased Sierra’s memory as well as her cognitive thinking processes. Gayle encourages Sierra to think through steps and describe the process of the steps in her own words. As a result Sierra is more responsive verbally. The activities of SpiritHorse have given Sierra leadership opportunities. Sierra has gained confidence in herself from the encouraging teaching here at SpiritHorse. We love Spirithorse and Ms. Gayle! My daughter has been taking lessons for 3 years and has come so far! We are grateful for the therapy she is able to receive! Please check them out, you will not be disappointed!! 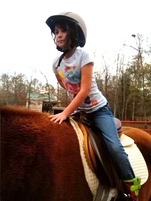 My oldest, special needs daughter, is absolutely loving her lessons at Alabama Spirithorse!!! She is learning skills and confidence in her abilities!! My younger children are learning about how to care for horses and how to take care of the stalls and all aspects of horses!! They are learning a lot, too!! Thanks Gayle Thorn!! My daughter absolutely loves it!!! This has helped build her confidence, works on her balancing and building her muscle. We loved coming to Alabama SpiritHorse! My 2.5 year old had a great experience & learned a lot. Gail & Anna worked very well together & my daughter loved working with them both. I would highly recommend this program to anyone! Fabulous !!!!! !Thank goodness we have a therapeutic riding center that really meets the needs of special needs individuals in the river region. The children are reaping the rewards of attaining their full potential through interaction with horses. Everything about this center is wonderful.